Daytona: Two-time Formula One champion Fernando Alonso won the rain-shortened 24 Hours of Daytona, overhauling Felipe Nasr two laps from the eventual finish on Sunday. The Spaniard became only the third Formula One champion to win the race, joining Phil Hill (1964) and Mario Andretti (1972). “It’s amazing” Alonso told NBCSN. “Just an amazing experience with this team, from the test and now the race — a perfect execution of the race. “Very different conditions and we’ve been competitive in everything — dry, wet, night and day. Really happy for the team and all the guys.” Alonso, who retired from Formula One racing after the 2018 season, said the victory would rank very high among all his accomplishments. “To win this kind of endurance racing at iconic places like Daytona means a lot,” he said. “With zero experience and background in endurance before (last year) it’s quite a big thing.” Already the winner of last year’s 24 Hours of Le Mans, the 37-year-old Alonso will attempt to complete the Triple Crown of motorsports by capturing the Indy 500 in May. Driving the Wayne Taylor Cadillac DPI, Alonso took command of the race for keeps when Brazilian Nasr failed to navigate turn one and drove into deep water, losing a 1.5-second advantage. By the time Nasr had things under control, Alonso was 12 seconds ahead. Kamui Kobayashi, Jordan Taylor and Renger Van Der Zande teamed up with Alonso for the victory in his second try in the 24-hour race, which was twice red-flagged because of rain and water on the track and was halted 10 minutes early. 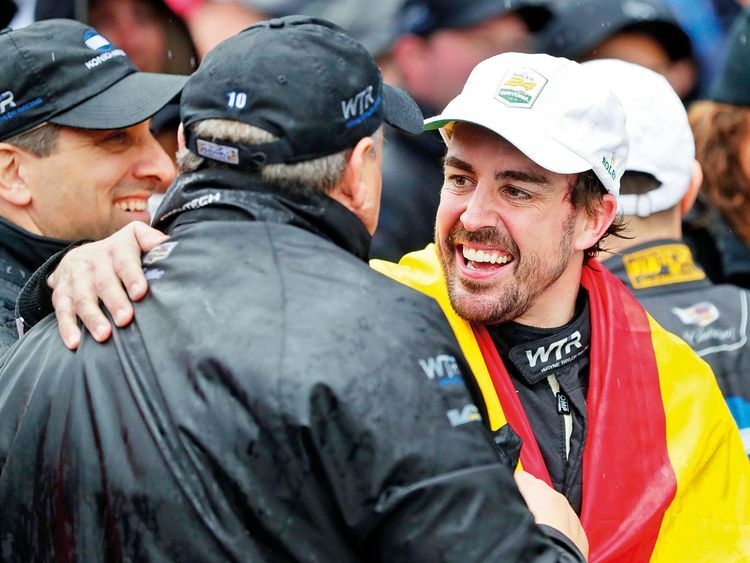 “With all the rain, I’ve never seen a race like this.” Team Penske boss Roger Penske told NBCSN. Alexander Rossi was the only other driver to finish in the lead lap. He took third. Italian Alex Zanardi’s return to endurance racing 17 years after he lost both legs in a horrific race wreck got off to a bad start 90 minutes into the race, At the beginning of his first stint driving, Zanardi encountered a problem with his steering wheel. The 52-year-old was using a special wheel with hand controls for the car, and the connecting pins were damaged when he attempted to connect it as the car was dropped from the jack. His No. 24 BMW Team RLL team finished 32nd overall and ninth in class.